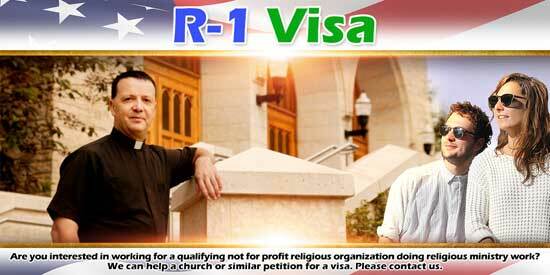 Are you a qualifying religious organization interested in the R-1 visa? If you presently need religious workers or ministers, we can help. We work with many religious organizations in petitioning the USCIS for R-1 visas, and R-1 status. Accordingly, this article is part of our guide on US visa types. If you know that you need help, please contact us. Otherwise, please keep reading. The R-1 visa first requires that you’re coming to the United States to be temporarily employed as a minister or in a religious vocation or other religious occupation full-time. USCIS specifically requires that the institution offering the employment have a not for profit designation from the IRS. Moreover, the sponsoring organization must be religious in nature. Besides requirements of the employment and the organization, the USCIS requires that you have been a member of a religious denomination that has a nonprofit religious organization in the United States. You must’ve held his membership for two years before the application is filed with the USCIS. Allowed Religious Roles: What Is a Religious Worker? In thinking about the employment offered by the religious organization, it is helpful to understand the types of employment the USCIS authorizes. Receiving an R-1 visa for work as a minister from the USCIS is correspondingly the easiest role to get approved. When an organization petitions for a religious occupation, the USCIS sets the bar for success high. Firstly, the petitioner must show that the work primarily relates to a traditional religious function. Then the petitioner shows that the duties carry out the religious creed and beliefs of the organization’s denomination. USCIS however denies applications filed by religious organizations for administrative or support positions like maintenance workers or fundraisers. The USCIS sees religious employment as a special type of employment. Therefore, your application for an R-1 visa uses the USCIS catch all I-129 temporary employment application. Once religious organization assembles the application, it submits it to the California Service Center. In filing the application, the petitioner may request that the USCIS notify a consular post. The petitioner may instead request that the USCIS change the status of a potential worker already present in the United States. R-1 visa applications are supported by documents like those that prove the religious organization is tax-exempt, and bona fide. One of the stumbling blocks to R-1 visa success is proof of compensation. USCIS requires that as this is a work position, the petitioner compensate the employee. Petitions without proof of compensation will not receive USCIS approval. Many religious workers do not receive salary compensation. The USCIS will consider nonsalaried compensation like room and board if the petitioner includes verifiable evidence. Self supported religious workers are a special case. If the religious organization is petitioning for a self supported religious worker, the USCIS requires it to meet additional requirements. It must show that it has an established program of temporary, uncompensated missionary work. This program must also be part of a broader international program of missionary work sponsored by the religious organization’s denomination. In showing that the organization does have an established program of temporary, uncompensated missionary work, the USCIS requires evidence of previous R-1 visa workers. The organization must also show that these missionary workers are traditionally uncompensated, and that it has a formal training program for them. Assuming that the petitioner meets all these requirements, the USCIS will approve R-1 status for the religious worker for an initial 30 month period. The USCIS allows a total of 60 months in R-1 visa status in the United States. If the religious denomination continues the worker’s employment past 30 months, it must submit a renewal application to the USCIS. Once the religious worker has spent 60 months in R-1 status, they must leave the United States for one year before once again receiving R-1 status. If the Religious Organization and the religious worker agree that the employment should extend past 30 months, the organization will need to petition the USCIS to renew the R-1 visa. You might think that given that previous approval the process would be easier second time around. You would be wrong. In filing the renewal application, the USCIS places a lot of emphasis making sure that whatever compensation the sponsoring religious organization offered in the original application the worker received. For salary compensation, the organization must provide proof with documents like W-2 forms or income tax returns. For nonsalaried compensation, the USCIS is looking for IRS form 1099. Where the religious worker supported him or herself, the USCIS requires proof like audited financial statements or statements from your bank or brokerage. Religious organizations who have a permanent need for a religious worker may petition for a worker’s green card. You may read more about getting a green card through religious sponsorship in our guide dedicated to green cards. We have filed many R-1 visa petitions and are very familiar with the process. We can advise qualifying religious organizations and workers. If you need help, please contact us.